1995 Civic Dx 1.5 non-vtec automatic, +200k miles 16 bent valves from my failed HG repair, ended up lowing it and cracking the transmission on a “pothole”(crater). Learned to drive with this car, mostly before I got my license. 1992 Lexus sc400, Traded the civic for it, drove it home with no steering rack or lca bushings, did a bunch of mods and stripped it over 3 years but catching fire sealed its fate earlier this year. I’d had this car since my provisional license. 1992 sc400 6 speed swapped, bought this for $2300 as a parts car(mostly to remedy the first sc’s failing auto trans), ended up running it for a year while the first car got stripped. Eventually tides turned as the chassis damage became excessive and everything got reswapped onto the first sc. 1991 Volvo 740 5 speed manual, bought for $750 as a daily but sold it because It wouldn’t pass smog. 1997 Mercedes c230, $500 for an Inline six with a blown head gasket that would get hot and eat coolant. 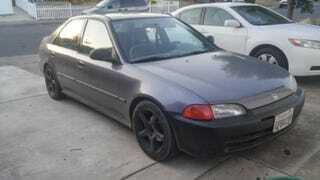 After a few months I sold it to my brother for the $1000 I had in it after I fixed the radiator and other bits. He sold it for $2400 somehow. 2001 Hyundia Elantra, My brother initially bought it for $500-ish with a ruined front end and 94,000 miles. We traded it back and forth over the course of a 1.5 years. We put Ebay panels on and ran it into the ground, eventually I sold it for $1000. 1996 BMW 325i, $500 with a blown head gasket. Eventually fixed the gasket and seized the motor. I blew a radiator hose testing said fix with no aaa and couldn’t afford a tow so i said fuckit and got home. Gave it away to some tweekers. 1997 Camaro v6, bought for $800 but oil pressure was always low and I disliked alot of aspects about it(garbage interior plastics , leaky t top), sold for $1200. 1989 Mercedes 190e, $500 interior and exterior were in decent shape besides sun damage, the transmission failed the second time I tried to drive it. Considering it was going to need money to get smoggable and a transmission I cut my losses. Sold for $120 because no one would buy it. 1988 Honda Civic 5 speed, bought for $1250 solely because it passed smog. Rust holes everywhere, driver window didn’t work, and a dying clutch. Drove it for a few month doing 170 miles a day 5 days a week(sometimes 1000 miles per week) for at least 3 months before I moved. Once I’d moved closer it sat. Didn’t start after a couple weeks so i sold it for $50 because I wanted it gone. 2001 Hyundia elantra, $500 from a coworker with 270,000 miles and lots of wear to reflect that. This list starts at 16 years old and ends at current which is 20, what have I learned so far? Evidently nothing, because I’m still buying $500 cars. Honorable mention before the civic around 14 or 15 I had a 1991 Subaru locale 5 speed thatd been sitting in a field for years, mice had taken it over. On startup dog food fired out of the muffler, the headliner had pounds of dog food in it. After a couple months the alternator wiring got messed up somewhere so my brother and i took turns driving it into trees. Got up to around 20mph. Eventually towed it away.